With few moving parts and limited maintenance needs, solar panels can last for years without experiencing issues. However, they still need a bit of preventative care to keep them running at peak performance levels. Regular checkups can save you from having to deal with costly repairs down the road. 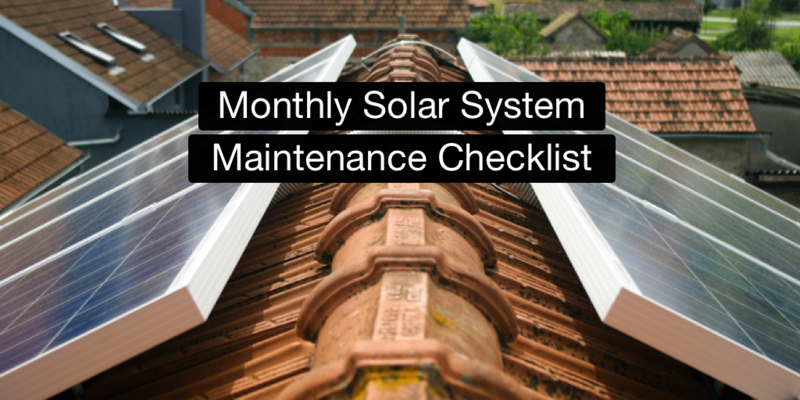 This checklist will guide you through the top five things to check on your solar system each month to ensure any maintenance is taken care of before small issues have a chance to become bigger problems. In order to properly maintain your solar system, it’s good to be well versed in each component. A solar system is comprised of the panels themselves, the rack and roof penetrations that affix the panels to your roof, and the wiring and inverters that tie your panels to your home’s electrical system and the grid. Familiarize yourself with your specific array’s setup, and then run through this checklist once per month to keep things ship shape. Safety Note: Because solar arrays conduct electricity and are often mounted high off the ground, conducting repairs yourself can be hazardous. This list is intended to offer inspection guidelines—not repair suggestions. We advocate for safety first, so contact a professional if you notice any issues when you conduct your visual inspection. Keeping your panels clean and free from any obstructions ensures you’re maximizing the efficiency of your system. Snow, dust, or leaves on your solar array should be removed regularly. A monthly check to make sure your panels are free of any buildup or obstructions should be enough to keep your system running smoothly. Don’t attempt to clear your panels yourself if it puts you at risk of a fall. Many solar systems are mounted low enough that cleaning or snow removal is possible from the ground using a long-handled broom or snow rake. You’ll want to verify that using such tools won’t void your warranty, however. For panels mounted higher—or for arrays with warranties limiting broom or rake use—the solar installer will likely have a solar panel cleaning service to recommend. Hiring professionals can help ensure that your panels receive a thorough cleaning and they won’t be damaged in the process. 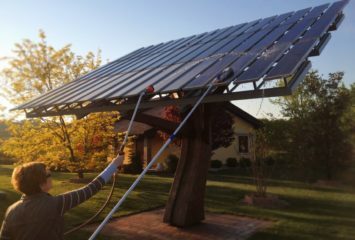 Solar panels mount to your roof using a metal structure called a rack. The rack carries the weight of the panels and holds them to the roof using several sturdy bolt penetrations. Your solar panel installer should do a roof inspection before installation to ensure your roof is structurally sound enough for solar panels. However, even on a sound roof, drainage issues can develop as roof materials naturally degrade over time. A monthly visual inspection of all roof penetrations is a good way to catch any potential drainage or structural integrity issues before they become serious. While it may be difficult to identify drainage issues from the outside, you should be able to spot problems from inside—in the form of leaks. Head up to your attic space to see if you notice any leaky areas under where the panels are mounted. Missing bolts can be another indicator of an impending rack failure. Panels can loosen in their mounts over time from the weight of snow or from high wind. If you do find a potential issue, contact your solar panel installer to inspect and repair the rack. Don’t attempt to make the repair yourself; since solar panels are part of your electrical system, this repair is best handled by a trained professional. Solar arrays are made using durable, long-lasting components—most systems can produce electricity for twenty-five years or more. The rack and the panels themselves will almost definitely be made from corrosion-resistant materials, but over a long enough time, corrosion can develop and compromise the strength of your system components. A visual check of your panels for any corrosion, conducted at least once a month, gives you the opportunity to address any issues with your system’s hardware before a more serious breakdown occurs. As with many of the other inspection points listed here, make sure you call your solar installer to perform any component replacements or repairs for your own safety. The silicon wafers inside your solar panels are covered by extremely durable tempered glass. This glass is rated to withstand a lot of punishment and is usually strong enough to weather even tough hailstorms. However, fallen tree branches or an especially bad storm can result in broken panels, compromising your system’s output. If you notice any broken panels, contact your solar installer immediately to replace the section. Depending on the nature of your system, your electricity generation may be cut off until the broken panel is replaced. These types of repairs should be conducted by certified solar installers, since the new panel will need to be integrated with the rest of your system. All solar arrays involve a component known as an inverter, which converts the direct current the panels produce into the alternating current used in your home’s electrical system. In many cases, each individual panel is wired in a series to one single string inverter, creating many potential points of failure before the electricity makes it to the grid and your appliances. Faulty wiring can be very difficult to diagnose. Sometimes, there will be a visual indication like a snapped wire or broken connection to rely on, although this may not always be the case. Luckily, there are two other ways to diagnose the system. Many modern solar systems come with real-time production tracking via a web portal or an app. If your system uses this technology, you can check to see if the array is underperforming; if you have an older system that lacks an app or online tool, you can use your monthly electricity bill as an indicator of any potential issues. If you notice a potential problem, a call to your local solar installer is a must. The electric current running from your panels can seriously injure you, so don’t attempt this repair yourself. Some solar companies will offer regular inspections of your solar system. If you want to ensure the longevity of your solar installation, a more comprehensive yearly checkup is a good way to round out your own monthly checks. Solar contractors have the expertise and know-how to find and address issues that you may not know to look for. With professional help and a comprehensive checkup plan, you can keep your panels working at maximum efficiency and extend the array’s lifespan.